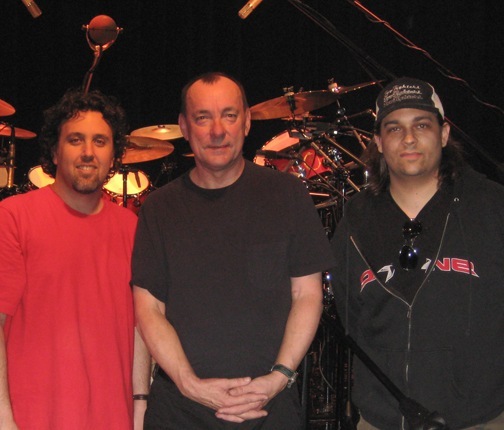 Update: 1/24 - Listen to a sample of Neil Peart Drums here. 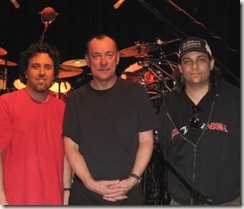 Neil Peart's Studio Profile by Sonic Reality, which was recorded in 2008, is going to be released in the first quarter of 2010. This release is called Neil Peart Drums Vol. 1: The Kit. January 2010, Sunrise FL, USA - For the Winter NAMM show of 2010, Sonic Reality sound development company is proud to announce "Neil Peart Drums Vol. 1: The Kit", a sample library for BFD2 and Infinite Player, powered by Kontakt, as part of the Drum Masters series. Neil Peart, legendary drummer of the band "Rush", has collaborated with Sonic Reality and producer/engineer Nick Raskulinecz (Rush, Foo Fighters, Alice In Chains) to bring the authentic sound of Neil's "Snakes and Arrows" Custom DW Drum Kit into the digital domain. With advanced features such as deep level dynamics, humanized random alternating hits, discrete multiple mic mixing and more, this deluxe sampled kit is an ultra-realistic recreation of Neil's actual acoustic set as used live on tour and in the studio. Now, for the first time, e-drummers, keyboardists and composers can play rock drum samples with the iconic signature sound of drum legend - Neil Peart and have a world-class, hard-hitting drum kit suitable for many styles of music from Progressive Rock to Heavy Metal! Producer Nick Raskulinecz engineered the sample sessions with over 20 channels of Neve mic preamps, deluxe vintage tube mics and multiple room positions for one of the most elaborate sampled drum kits ever. With the assistance of Don Lombardi and DrumChannel.com, every detail of "The Kit" was captured both in high-resolution audio and documented on video with a thorough explanation by Dave Kerzner of Sonic Reality on how the drums were sampled. "To sample Neil Peart's incredible drum kit for our Drum Masters series was truly an honor and it fit perfectly with our focus on capturing the most desirable character drum sounds." Says Dave Kerzner, CEO of Sonic Reality. "We're also honored to be able to record it with 'Rush' producer - Nick Raskulinecz to help us capture the authentic, signature Neil Peart drum sound." "The Kit" features 8 Toms, a vast array of cymbals including 3 Chinas, 4 Crashes, 3 Splashes, Ride, 2 Snares, Massive Kicks, Percussion - such as Cowbells and more. It comes mapped in GM, iMap, V-Drum and a Custom Map mode to be controlled by any electronic drum kit. It includes both discrete mic mixing and album-quality presets right out of the box for instant gratification. "Neil Peart Drums Vol 1: The Kit" will be available in standard and deluxe size versions for FXPansion's BFD software and for Sonic Reality's Infinite Player software powered by Kontakt. The Drum Channel now has a free preview available of the Buddy Rich Memorial 2008 concert. The full concert is scheduled to be available on-demand on December 23, and then on DVD and Blu-ray in 2009. The Neil Peart segment is near the end, and it includes a bunch of camera angles including a footcam! Back in April this year, we learned about a Neil Peart Studio ProFile project from Sonic Reality. While there's no confirmed release date, Sonic Reality told me in e-mail this week that they were looking at a possible April 2009 release. I'll keep you posted about this project. To read more, go to this blog category. According to the KVR audio forum, a company called Sonic Reality recently completed a Neil Peart drum sampling session, engineered by Nick Raskulinecz. It appears the session started on March 18 in Los Angeles, and the final product is scheduled to be released by the end of 2008. The end result of this project will be a "Neil Peart Studio Profile," most likely a complete sample of Neil's Snakes & Arrows DW kit and his V-drum sounds -- and possibly Neil Peart loops. Sonic Reality has produced other Studio Profiles on such drummers as Cheap Trick's Bun E. Carlos and Yes/Earthworks/King Crimson drummer Bill Bruford. If you're curious about what this all means, you can basically buy professionally-recorded sampled sounds of drummers that you can use with music software on a computer -- or plug these samples into keyboards or electronic drums. Studio Profiles cost around $79.00. In addition to this exciting news for drummers and other musicians out there, there are a few tidbits in the forum write-up by Squid (in several posts, which I edited a little). One thing that he writes about is the DW Snakes & Arrows kit will be available to buy in the near future. Squids and Co in LA right now. We're doing a session with Neil Peart today! It's more than just me sampling but yes we are sampling his drum kit too! I will reveal more about the project when I am able to. So... I am at The Foo Fighters' studio right now. We just listened back to the tracks with Neil. HOLY S#$#*(%*#T!!!!!!!! There is this SEISMIC floor tom in his set that is the most massive boom! Wow. Explosive! Can you imagine playing Neil's kit? I can't WAIT until this is mapped. But, that is just one part of this session we did. There's more to it than that... very cool. Nick Raskulinecz who I think did a phenomenal job producing the last Rush album is co-producing this particular project with me (his studio is the Foo one... he mixed a bunch of Foo records) and it's really amazing that Neil and everyone are up for it! Very exciting. ... Anyway, I was talking to Neil about playing his own kit from V-Drums after and he wasn't as interested in that (as say Omar Hakim was). So I think Neil is more just open to the idea of everyone else getting a chance to play around with his drum kit sound (and the rest of the project)... which is surprising and very cool. He's never done anything like this before. I was tempted to ask Neil about Rush lyrics. It's incredible that he's such an amazing drummer and writes those complex lyrics as well. I've always been curious what some of them mean or why he chose certain words that you don't commonly hear. But I wasn't sure if he'd want to talk about it or not so I didn't go there. I asked Nick if he ever talked at length to him about it and he hadn't either (with some significant hang time having produced the last Rush album). Neil is very comfortable with Nick so it was a good thing he was there. Plus Nick is a fantastic engineer. It was a very interesting mic set up. Two RCA ribbons for one room set and two U67s plus a Telefunken 251 mono room. 3 C12's for overheads to capture Neil's enormous kit. 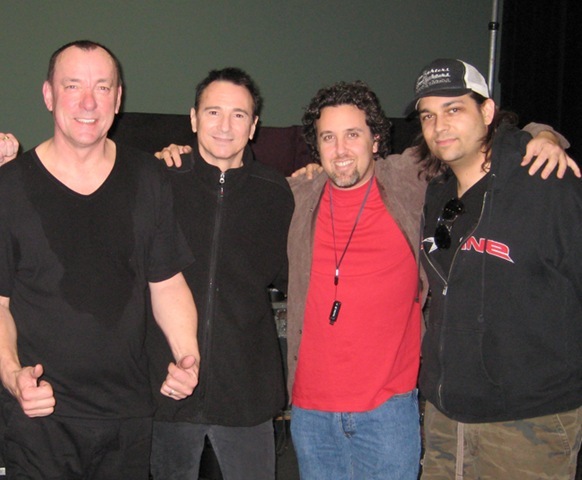 Anyway, here's a cool pic of Neil Peart, Terry Bozzio, me and Nick Raskulinecz. Nick was amazing in the session. He's one of the hottest producers around right now. He produced the last Rush album and three Foo Fighters albums and a bunch of other stuff. Cool guy and fun to work with too! Terry Bozzio is another really cool person who came by when we were recording Neil Peart. We have sampling session coming up with Terry recreating the sound he got with Missing Persons and producer/engineer/manager Ken Scott! Me, I'm just weaseling my way into a pic with these legends. ... Apparently this "Neil Peart Kit" spec is or will be available to buy from DW! You wanna hear something totally cool? Neil liked Nick Raskulinecz' work so much on the last Rush album that for Nick's birthday a truck showed up at Nick's door with that DW kit as a present. Nice present huh? Shows you the kind of guy Neil is... and the kind of people the whole band and label are. Very grateful and generous. When we were done, Neil signed a drum head for me wishing us success with the project. ... So... okay, yeah we're doing a Neil Peart Studio ProFile. But there's more to the session than that... quite exciting stuff! More news later.